A few years ago, outside the stage door of a Broadway theater, I found myself herded into a cattle holding pen along with about 200 other people. My friends Michael and Kim and I were waiting for Broadway legend Kristin Chenoweth to come out and greet us after a performance of the show she was starring in at the time, Promises, Promises. And yes, this is the same Michael who often thoughtfully, eloquently, guest blogs here. Michael and Kristin Chenoweth grew up in the same town and attended the same high school. They walked the same halls, performed on the same stages, learned from the same teachers. In fact, one such teacher, whom Michael is still close to, was the reason we were ushered into the front of the holding pen. There had been the possibility that we would get to go backstage, but it didn’t pan out. To her credit, Kristin was gracious when she came out. Michael teased her by calling her Kristie Dawn, the name she went by when she was just a young Oklahoma girl with a big voice and a dream. She good-naturedly dead-panned, “Don’t call me that.” She and Michael talked Broken Arrow for a few moments, then she signed our programs, said hi to a few others and then climbed into a waiting SUV and was whisked away. And I was both exhilarated and depressed by the experience. It made me us feel both special and insignificant. But while she and Michael stood talking, I felt an odd resentment boiling beneath the surface. I thought, Kristie Dawn, you really don’t know who you are talking to. Talk about a legend. I met Michael several years ago when we did Party together. He was, even then, an available, funny, skilled actor. And through the years, I’ve been lucky to see him in many roles and he continues to expand himself. The last thing I saw him in was a production of Greater Tuna where he expertly and seemingly effortlessly became 20 different characters, 20 inhabited lives. And if Michael were only an actor, that would be enough to make him the kind of star around which the world orbits. (Full confession, I’m no Isaac Asimov.) But, I think the thing that makes Michael truly a legend is that he’s the best friend anyone could ever have. I know a lot of people, but I don’t think I know anyone as beloved as Michael Patrick Gaffney. And if you’re reading this and you know him, you know what I’m talking about. He remembers the details of your life, he reminds you of memories that you’ve shared, he does not pontificate, but always makes you feel he’s rooting for you. And I can never see Lucille Ball or peanut butter or a lady bug without thinking of him. I don’t know if MPG will ever be as famous or as rich as the little one (his name for her, not mine.) If we lived in a world that made sense, he’d have Tonys and Emmys and 912,398 Twitter followers, too. But I actually think, in many ways, Michael’s life is richer than, well, richer than most. He is loved and he knows how much he is loved. And we’re just lucky to have him in our lives. Because I knew him, because I know him, I have been changed for good. Yesterday, I was discussing the Broadway revival of The Glass Menagerie that I was lucky enough to see last week. The person I was speaking with, an actress of a certain age, asked me what I thought of the production. I told her that when you see a play like that, you have a hope that you are going to witness the definitive portrayal of these iconic characters. I had hoped to see the definitive Amanda, the matriarch of the Wingfield family or the definitive Tom, the narrator and central, autobiographical character of the play. In my humble opinion, that is not what I witnessed. Both Cherry Jones and Zachary Quinto gave heartfelt, formidable performances, but I left wanting a little more. I confess to you that I actually gasped a little when she said that. “You mean Laura?” I asked. “No, Amanda.” Jane went on to tell me that many years ago, she had been in the same acting class as Marilyn. She told me her Amanda would have been something to see. In some ways, I’ll admit, I couldn’t see it. And yet, in the two days since she put this idea in my head, it’s all I can think about. One would not have a hard time believing that Marilyn’s Amanda would have had a trail of gentlemen callers. One would not have a hard time believing that Marilyn’s Amanda would have chosen the most unpromising of those gentlemen callers. Marilyn’s Amanda would have understood that Williams is funny. And Marilyn’s Amanda, entering the living room with the ridiculous old cotillion dress from her youth, would have been, as Jane put it, something to see. So many possibilities. 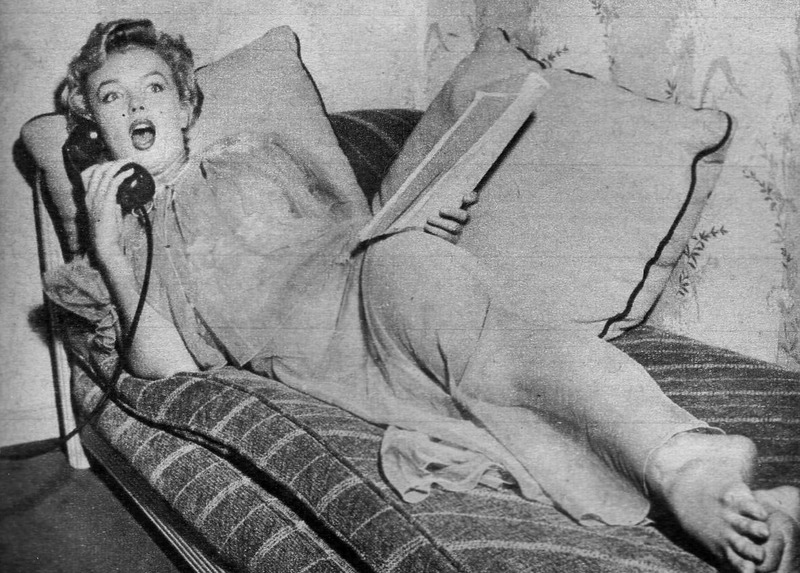 If you are a drama nerd like me, and you’re still reading this, no doubt, you’ve had your own opinions pop into your head about the possibility of Marilyn Monroe’s Amanda Wingfield. Maybe you like the idea, maybe you hate the idea. Whether over a cup of coffee or a Makers Mark neat, these are the conversations I love. Because this is the way my little brain works, I think of what might have happened if Marilyn had played Amanda. What might Amanda have unlocked for Marilyn. There is something exciting about living with a character that helps us understand the world we live in and understand ourselves better. Maybe Amanda could have saved Marilyn, maybe she wouldn’t have left this world so young. And maybe Amanda would have turned Marilyn into a great actress, not just a compelling movie star. And there is something else about yesterday’s conversation that I’ve carried with me. It goes back to those possibilities. I told Jane that Marilyn as Amanda sounded so wrong and Jane said, “It might be! And it might be so wrong that it’s right!” Maybe this conversation will unlock in me the practice to see the possibilities for myself, that Tom Wingfield isn’t the only one with tricks in his pocket, things up his sleeve. Just a few minutes ago, I finished watching a French movie called Beau Travail that I’d dvr’d on Turner Classic Movies, it is a movie about, wait, never mind, there is no need for me to tell you what the movie is about, there is no reason for you to watch it. It’s boring and it’s not even long. For 90 minutes, I sat on my couch, sipping a little whiskey and eating cheese and crackers, wondering why I was watching this movie. My answer came at the end, or rather, after the end, when after the credits, TCM played a mini-documentary about the making of my favorite movie (one of my favorites, anyway) Fame. I remember when I saw Fame for the first time. It was the summer between my 6th and 7th grade year, in the living room of my childhood home (imagine that!) and I watched it on HBO with my cousins Tracey and Stacey who were visiting from Colorado. I already loved anything theatrical (I was just coming off of that Charlie Brown high from 5th grade) and something about the movie: the songs, the dancing, the acting, hooked into something inside of me, something at my core. I remember how nervous the Montgomery character made me. Gosh, I thought, I wouldn’t want to end up like that guy! And even though I was a land-locked Kansas boy, I dreamed that one day, I would attend the High School for the Performing Arts. Alas, that did not happen, but I did make my way to New York eventually, and from the minute I stepped off that Greyhound bus, I did feel like I’d entered a city that pulsated like the choreographed, gritty, magical, mercurial 1980 New York that Alan Parker gave me (ME!) in that movie. And if you’ve been reading this blog, even just a little, you could understand how this movie might have resonated with me through the last 35 years, through every phase of my life. Which brings me back to tonight, those few minutes ago, when this documentary came on my television. And I loved watching these young actors, kids at the time, talk about the characters they were playing. I always think of those actors, Irene Cara, Maureen Teefy, Paul McCrane, Barry Miller and the rest, in this revered way, the way a freshman looks up to the seniors at his high school, but I was struck by the fact that these actors were probably 16 to 20 at the time, just babies. The documentary showed behind the scenes of filming many musical scenes, including Hot Lunch Jam, I Sing the Body Electric and of course, Fame, where the entire cast is dancing in the street, on car roof tops and such. Perhaps it was the whiskey, perhaps it was something purer, but I felt the need to rise up and dance along with these teenagers, my idols, as they danced through the streets of Manhattan. Where am I going with all this? Well, I’m not completely sure. I will say that one thing I love about art, be it paintings or music or movies, is it’s propensity to incite time travel. As I watched this documentary, I was every age I’ve ever been since I first saw the movie. I was 12 and 17 and 24 and 34 and 39 and 45. And then I thought how wonderful it is that a movie or anything, really, could make this 45-year-old get up off his couch on a Tuesday night at 10 pm and dance without abandon. It makes one think that they could live forever. Today is Marlo Thomas’ birthday! Happy Birthday, Marlo! 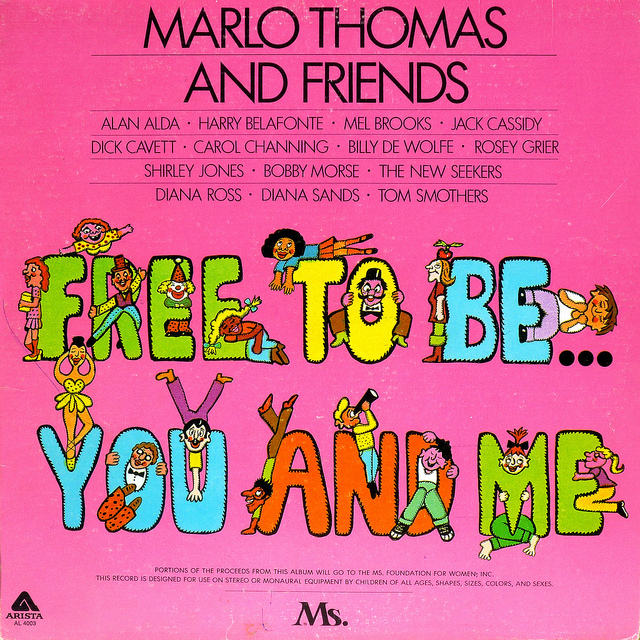 When I think about Marlo, I think about her iconic 1970’s tv special, Free to Be You and Me. And when I think about that, I remember my 5th and 6th grade teacher, Mrs. Tideman, who introduced that tv show and soundtrack to me and the rest of the 4th and 5th graders in her combined class that she taught back at Washington Elementary. I don’t remember ever having a creative awakening before Mrs. Tideman’s class. I’d had good teachers, I’d had bad teachers. I remember doing fairly well in spelling and math and less well in history and science. But Mrs. Tideman is the first teacher that expanded the concept of education into things like writing poems. We had to write a poem every few weeks, and I hope this doesn’t sound like I’m bragging (glory days and all) but I was a pretty good poem writer. I had a knack for making things rhyme, it came to me fast, in quite little time. And though my penmanship could have been neater, I even mastered the concept of meter. At one point during my 5th grade year, Mrs. Tideman announced that we were going to put on a play. It was called, “You’re a Good Man, Charlie Brown.” There would be auditions and rehearsals and two performances in the school gymnasium. She gave those of us who wanted to audition, copies of the script. I auditioned for Linus, Snoopy and Charlie Brown. And while I still contend that I could have played Snoopy, I was actually born to play Charlie Brown. I was Charlie Brown, and at ten, I always felt that the world was against me. Plus I was horrible at sports. So, there is some irony in that the first time I felt like the world was rooting for me, was when I played Charlie Brown. It was a life changing experience. The next year, when by some miracle, she was now my 6th grade teacher, Mrs. Tideman brought in the cast album (or maybe the soundtrack) to the musical, “Oliver!” She announced that this was the play she’d hoped to do that year, but she had to have an operation. She told us that she loved teaching kids, but she’d always dreamed of having her own child and she’d been unable to get pregnant. She then explained that she was going to have an operation to increase her chances of getting pregnant. And then she told us she was going to be gone for several weeks. And then we listened to “Oliver!” and it seemed even more of a dirge of a musical than even Charles Dickens could have imagined. And the weeks that she was away were unendurable. And when she came back, we were all so happy, but also scared because for awhile, she seemed quite vulnerable, not like the old Mrs. Tideman. As an adult, I think about how she and the administration would have wrestled with just how much to tell her students. I’m sure there are things they kept from us, as protection. (There is also the possibility I might be remembering it slightly differently than how it really happened.) But the experience was one of my first lessons in the frailty of life and how adult life (like childhood life, but with more at stake) did not always turn out the way you thought it would. I’m grateful that she opened my eyes to my own creative possibilities, but more than that, she opened my eyes to the way life works, like what a mother will do for her unborn, unconceived child. The good news is that after we graduated 6th grade, Mrs. Tideman became a mother. If I recall, her daughter’s name was Katie and she’d been named long before she was born. Katie would be about 35 now. (Dang, I’m old!) I have no idea where Mrs. Tideman is today, she moved away and even with several internet searches, I’ve never been able to find her. I’ve even tried to find Katie. And for the record: I’m no amateur at google sleuthing. Getting back to Free to Be You and Me, I’m posting the opening credits here as my little tribute to Mrs. Tideman, a teacher who took my hand and asked me to come along, and lend my voice to her song. Free to be you and me, indeed! 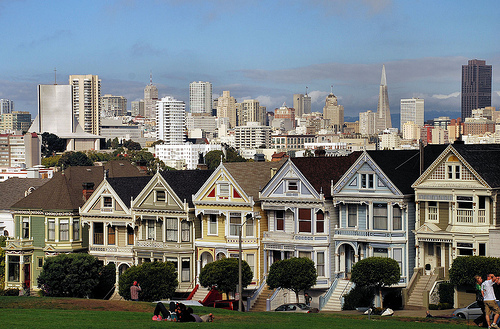 When I was 28, I lived in San Francisco. I went there to do a play and met a guy and we fell in love and I ended up staying there for a year and a half. The play, written by David Dillon, was called Party, and it was about seven gay guys who get together for a party and end up playing a truth or dare type game and guess what, everyone gets naked. (It was the 90’s.) I played Andy, the innocent one, who at one point emerges from the kitchen buck naked only to lick whipped cream and M&M’s off a guy’s bare torso. (It was the 90’s.) Every night after the show, I would come out the stage door and my boyfriend Gary would be waiting for me on his motorcycle. Because there was a certain amount of attention for the play, there were always people waiting outside to meet the cast as we exited. Still playing a part, I’d shyly and politely wave to the fans and get on the back of the Gary’s motorcycle, put on my helmet and then we’d ride away. We’d ride down Geary on our way to our home near Alamo Square Park and we’d sing songs we’d made up at the top of our lungs. Our favorite was this uptempo modified version of Dolly Parton’s tearjerker Me and Little Andy. Basically, we’d sing the song to the tune of Lullaby of Broadway. “Ain’tcha got no gingerbread, Ain’tcha got no caaaandy, Ain’tcha got an extra bed for me, me, me, meeee. Hey! I’m little Andy!” Just reading this, I’m pretty sure the memory is not completely translating to the page, and I suppose that’s okay. When you are in love you have these inside laughs that only make the two of you giggle and they don’t really make sense to anyone else. Even our nicknames for each other didn’t make sense. He was Gorgeous Rogers and I was Gingerbread Rogers. Alas, we eventually broke up and I moved back to Los Angeles. For a few years after my return I had a very difficult time moving forward. Every guy I dated paled in comparison to Gary. Superficially, they weren’t as well dressed or as cute or as financially secure as Gary, but mainly they could not make me laugh the way Gary made me laugh. One day, a couple tormented years later, I called Gary to tell him I could not talk to him anymore, with tears in my voice I said it was just too painful. He kind of laughed and said, “But Gingerbread, why?” I said, “And you can’t call me Gingerbread anymore! It’s too intimate.” He said okay and then I told him I’d call him when I was over him and he said okay. I’ve probably only seen him a handful of times in the last 10 years. I did eventually get over him. I’ve spent time with his current partner of 12 years, a guy that I like a lot and the two of them have built a fabulous life together. 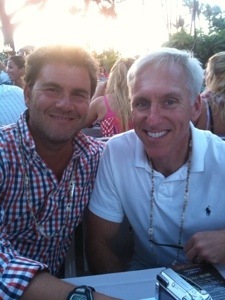 As for myself, I met Eric a few years ago, and I’d like to think we, too, have been building a fabulous life together. There are many things I love about Eric, not the least of which: he makes me laugh. Which brings everything up to yesterday when I picked Gary up at LAX. He’s in town for a conference and I brought him to his hotel and Eric met us there so we could have a quick drink before Gary went on to a dinner that was part of the conference. The meeting was friendly, jovial, uneventful. We talked about the things 40-something urban gays talk about: real estate, New York, Bravo, our dogs, Barbra. I was waiting for them to bond over their shared feelings about my driving skills, but thankfully, it did not happen. Then before I knew it, we were saying our goodbyes and Eric and I walked away, on our way to our own dinner at a restaurant that the two of us like going to together. It was so regular but it was also a special moment for me. For years, I wondered if I would ever love someone as much or more than I loved Gary and as it turns out, I would and I do. 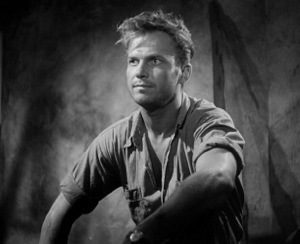 Yesterday, at the Festival, someone was telling an anecdote about the actor Ralph Meeker. 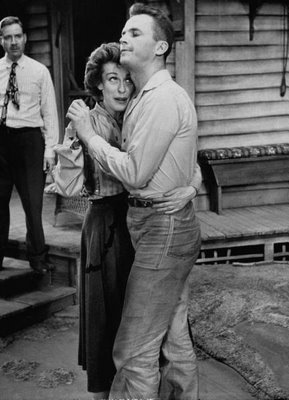 The anecdote itself is not worth repeating but the takeaway for me was that Ralph Meeker, according to this person’s mother, was gay and struggled with playing the course, virile Hal in the original Broadway production of Picnic. Obviously, as an actor who often plays heterosexuals (though usually less course, virile ones) I was reminded of the on going challenge for the gay actor playing straight. I suppose in some ways it was easier and then in some ways more difficult. And then, I thought I would do a little google sleuthing to find out more stories about Meeker’s sexuality. I found nothing. Nothing on IMDB, nothing on Wikipedia, even gayorstraight.com said he was heterosexual. So, who knows. I will say that looking at old pictures, I do wish he was gay, he is a heartthrob. Maybe it’s a little inappropriate to out an actor who does not seem keen on being outed from his grave, but I suppose at the end of the day, Ralph Meeker was an actor. I’m sure he’s just glad people are still talking about him.